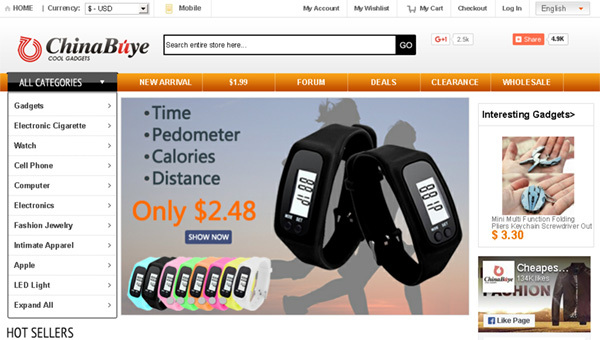 ChinaBuye is a Chinese online shop that offers free international delivery. The store functions since 2006 and considerably increased its range of goods ever since, including cell phones, tablet PCs, computer accessories, accessories for cars, torches, toys, jewelry, various household articles, as well as clothing, shoes, and much more. The shop also became famous for its low prices and a large number of discounts such as coupons, bonus program, aimed at writing reviews, as well as the provision of free goods for writing reviews. ChinaBuye accepts such payment systems as PayPal, Western Union, Credit cards. If you cannot pay for your order with any of these options, you can send your payment by Wire transfer. Regular free delivery is carried out within about 15-35 days by AirMail. The cost of express delivery depends on the weight and size of the package. If there is no the DHL postal service in your town, the parcel will be delivered by EMS. Delivery time depends on location and season, ranging from 1 to 3 weeks. You can buy a tracking code for $1.90. After eight e-mails, and replies, they still don't understand me explaining that an actioncam ks not working. Hallo, I have bought a handy from Blackview and I must declare how unhappy and unsatisfied I am with it. It is nothing what it it is suposed to be. Further more, they do not except my varanty whit an excuse that it was man made. What is it suposed to be made from?god? Farries? it is a total scam, and I wish to warn everybody about Blackview! Do not buy, do not trust, do not be naive as I was!!!! Hello, This web chinabuye is a bad page, i made an order and never came. I made a complain and doesn´t have my money back. I tell them to do so, but already has past 6 months and nothing. I never buy in chinabuye. Please do not buy from www.chinabuye.com, search for another web. Or you will lost money. Do not buy from Chinabuye. I bought a phone from them for $150. It took 60 days to arrive thus negating the option of getting your money back through Paypal. It lasted a week and then kept stalling, then turning itself off and even turning itself on. I would have to take out the battery to make it boot every time. It was doing this up to 20 times a day. Chinabuye completely ignored me. This has happened to thousands of buyers from reading various forums. I cannot afford to lose that much money because I am a pensioner. Last week the phone went in the rubbish, To all buyers...BEWARE...read all the forums.